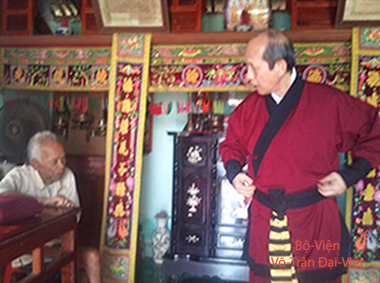 The Martial Clothing in the SA-LONG-CƯƠNG School System designed before by the Grand-Master Trương-Thanh-Đăng for Martial Students - Tee-Shirt and Boxer Short replaced later by the baggy long Trousers - is only suitable for tropical lands and within the framework of home training. 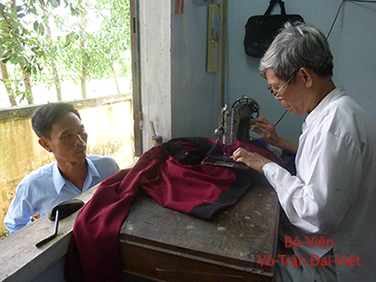 During the establishment of the first Sa-Long-Cương Drill Hall abroad, in 1968, we had presented the Students Martial Clothing design for Grand-Master Trương-Thanh-Ðăng approval according to the vietnamese tradition : Crossed neckline Jacket, long sleeves with puffed cuffs, ankles baggy long Trousers (pants) and a large soft Belt tied waistline round. This Belt represents also the Rank and Degree of the Martial Arts practising. 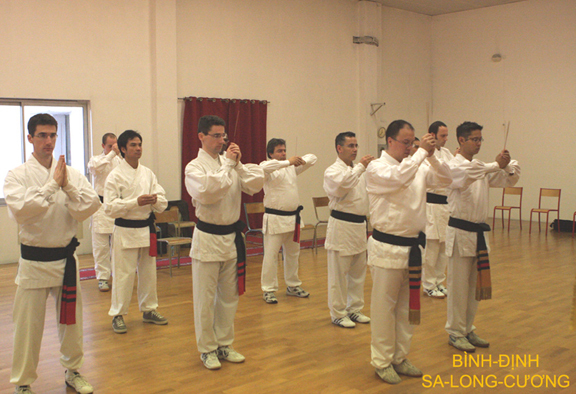 In addition, Martial Students wear sport shoes for feet protection. 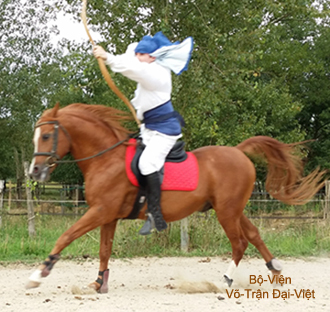 - The Crossed neckline Jacket is closed from armpit into hip ; what makes it doesn't come undone while the combat. 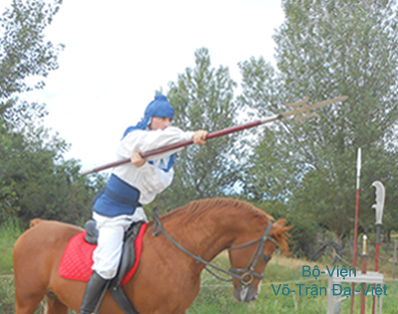 - The ankles baggy long Trousers (pants), holding a large bottom, is truthly convenient to train for Postures and Kicks techniques, as for the Equestrian Archery and the wielding of Pole Arms (Vouge, Pertuisane, Spear, Halberd, etc.) 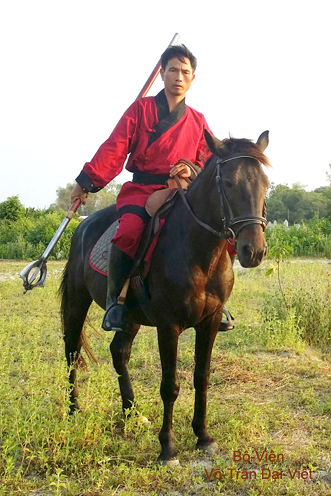 on horsebackl. 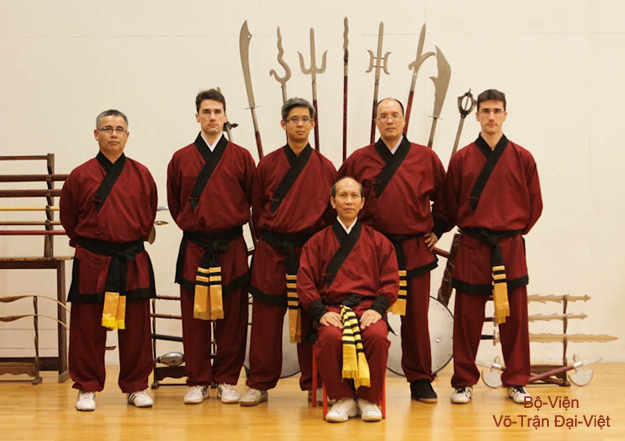 - The large soft Belt feld longitudinally in half and tied waistline roundlarge below the navel is both a belt* for making really the use of Internal Work easier and the one representing the Rank and Degree of the Martial Arts practising. *Remark : This belt is aided efficiently by a second belt, tied on the inside, called "Internal Energy Belt". 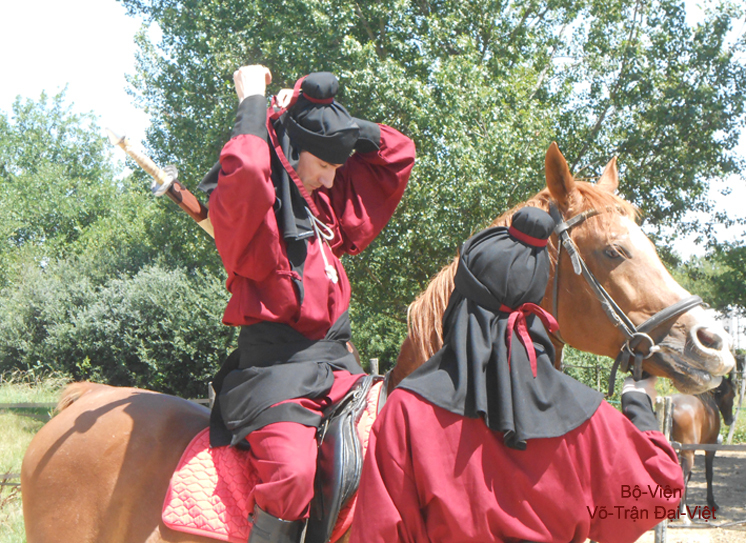 - The Crossbelts are used to bear Sword ; it exists two kinds, those for having Sword slung over one's shoulder and those for bearing Sword on the left flank. 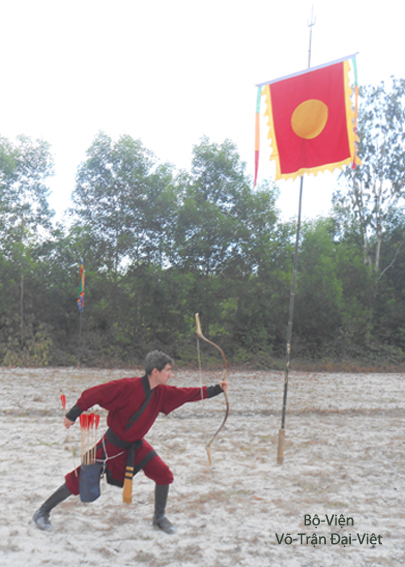 a Crossbelt during his training on foot fighting. 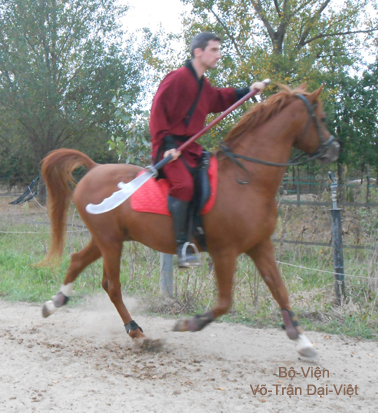 a Crossbelt during his training on horseback. 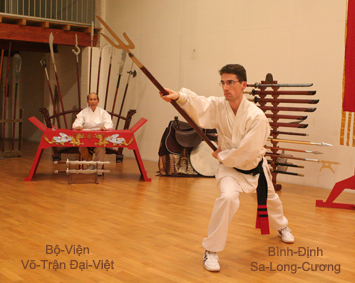 while demonstrating the Trident « Vũ-Khách Đinh-Ba »wielding on foot fighting. 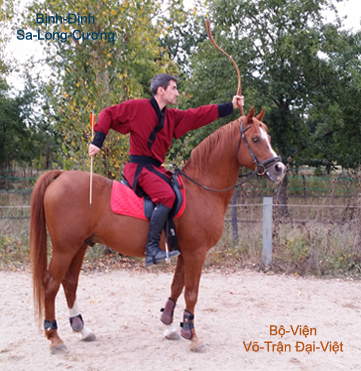 while demonstrating the Halberd « Phương-Thiên Họa-Kích » wielding on horseback fighting. 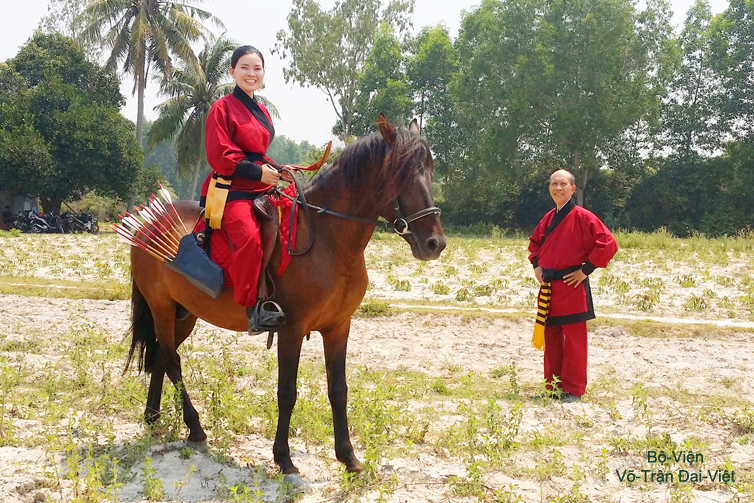 during the training for various techniques figures of Archery on war horseback (Kị-Xạ). 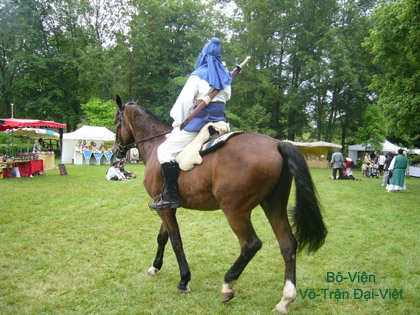 In addition, the Võ-Trận Đại-Việt Department uses also traditional dark red colour Medieval Military Clothing for wearing under the steel tempered Armour during the training for Armoured Medieval Tournament on foot fighting and on horseback fighting. 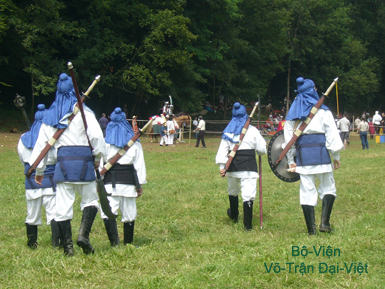 about the martial clothing from Võ-Trận Đại-Việt. 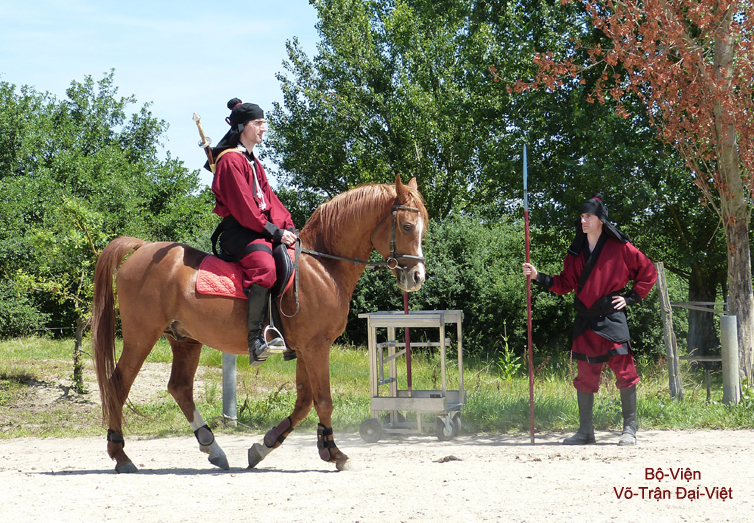 with traditional dark red colour Medieval Military Clothing.